The programme "Odyssey of Mind" was born in the USA in 1978 and during 16 years of its existance found adherents and like- minded persons on all the continents. Once a year ( in the end of May ) the World Final Contest is arranged in the USA, and the best teams come there from different countries. At present children from more than 20 countries take part in the programme and the final contest gathers 14-18 thousand of children and teenagers. 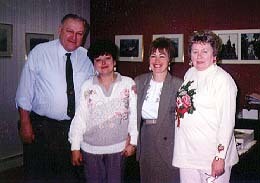 Nelly Zalyapina and L. Patselya. 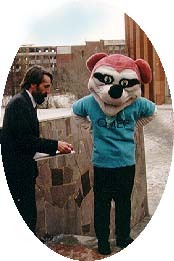 Russia has been taking part in the programme from 1988 and Chelyabinsk region -- from 1991. The Head Administration of Education of Chelyabinsk region, the Administration of Education of the City and Chelyabinsk Technical University were organizers and inspirers of the programme in our region. The interest to this programme is growing everyyear: from 9 new - comers in 1991 the number of teams - winners, participants of regional competitions grew to 200 in 1996. An independent association " Odyssey of Mind" was established in 1993 in Chelyabinsk region; its director is a member of European Organizing Comitee " Odyssey of Mind" (OMEOK) and a member of the International Association (OMADAP) and he represents our region on the international level.